Manned by a team of sincere and skilled professionals we are today counted among one of the leading manufacturers, suppliers and exporters of a wide array of Pressure Booster Pumps blended and fabricated using standard quality raw materials supplied to us by our reliable vendors in the market. Our product-line is available in a variety of sizes, shapes and designs so that we can efficiently cater to the variegated requirements of our esteemed customers in affordable prices and with on time deliveries. We are offering Pressure Booster Pumpset to our client. 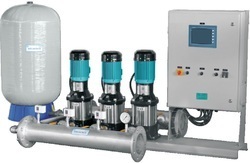 Booster Pump is the device used to increase the pressure of existing fluid flow systems. They are designed to help pumping systems achieve higher flow rates and overcome high system head. Typically, booster pumps are used in water systems or applications that have low waste contamination. They have a variety of commercial, municipal, and military applications and are used in a range of industries, including aerospace, mining, and food processing. Booster pumps work in conjunction with other pumps, meaning by themselves they cannot transport any fluid in a system. They are designed only to boost the performance of an existing pumping system. Booster pumps are considered centrifugal pumps, relying on one or more impellers to draw and move the fluid.